Brenda Faatz is a critically acclaimed musical theatre performing artist and founder and director of the Notable Kids Arts Center in Denver. Peter Trimarco is a former music industry art director and executive producer who has turned his energy to creating children’s books with his wife, Brenda. He is also co-owner and publisher of Beyond Cinema Magazine. Together, Brenda and Peter are inspired by the children they work with (whom are so often each other) and hope you and your children enjoy your adventures with Lizzy! The flaming redhead Lizzy is back! One of the most adorable, authentic, dynamic but sometimes insecure, most impressionable main characters in contemporary children’s literature. It’s just so amazing! This time It’s Just a Bunnypalooza! documented in rhyme and illustration by Brenda Faatz and Peter Trimarco – creators of the pantheon of Lizzy, It’s Just So … books. What is true of one is true of all, but this latest Lizzy adventure is just so … perfect! Lizzy is a young girl, once an only child, but she’s never been totally alone inside her vastly imaginative world of hyper-curiosity and manic wonderment for adventure. And she does have friends, whom she would love to impress at this year’s school jamboree with the “toe tappin’, jump jivin’ … bunnybombastic” dance moves taught to her by her bunny friends. Alas, she misunderstands the giggles from her school chums. 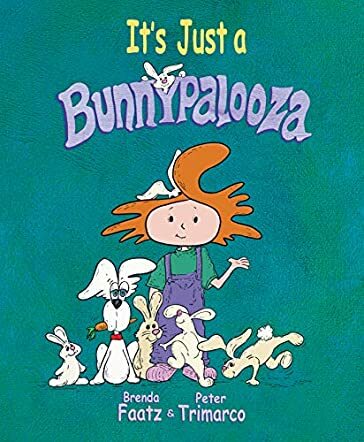 Brenda Faatz and Peter Trimarco are marvelous at conveying Lizzy’s drop from dizzying excitement to depressive disappointment in It’s Just a Bunnypalooza! An emotional, instantaneous fall that children will all too readily understand. With rhyming couplets pitched perfectly to a child’s ear, and lively illustrations to warm the coldest soul, this heartfelt story of Lizzy’s abandonment and timely rescue by magical intervention is just so … “jigga-wiggalous!” These made-up words are integral to the Lizzy books. They are the hooks to capture and enrapture young readers; they are the exclamation points to all the fun. And though these stories are filled with learning adventures to help a child’s growth, make no mistake, they are all about having fun! And the big-eyed dog? He seems rather clueless, but he’s always there, especially for the fun. It's Just a Bunnypalooza! is a children’s picture book written by Brenda Faatz and Peter Trimarco, and illustrated by Peter Trimarco. Lizzy agonized over the slowness of the clock in her classroom. She was so anxious to get started on her brainstorming for the Spring Jamboree Show, but the day seemed to go on forever. Finally! Finally, the clock hit the magic hour of 3:00 p.m., and Lizzy rushed outside to share her excitement with her animal friends. All the critters had assembled in her backyard, and they were ready and eager to help Lizzy find her talent and prepare her performance. What could she do? She began by imitating her bird friends and whistling a tune, but it just didn’t seem to have enough oomph. Likewise, bugling like an elk was definitely ho hum at best. Lizzy and her animal pals kept trying and turning down each feat of acrobatics, sounds, even hummingbird flights, but then the bunnies helped Lizzy come up with the most fantastic ideas. It's Just a Bunnypalooza! explores the creative process from a child’s perspective and it’s absolutely marvelous! I loved seeing Lizzie and her animal pals consider all her options and couldn’t help but agree that the bunnies had the best option of all. Peter Trimarco’s illustrations work so well with the story, especially when he translates the bunny dance moves into marvelous choreographed images of Lizzie’s dancing. Kids will find loads of fun things to look at on each page in this creative book that teaches confidence and self-worth. The authors also include a glossary that describes each of the dances the bunnies demonstrate, and there are a lot of them. Don’t forget to check out the alphabet pictures when Lizzie gets back to class for a special treat. It's Just a Bunnypalooza! is humorous, gentle and filled with dancing by a cast of what seems to be thousands of bunnies. It’s most highly recommended. When a book aimed at 3-7-year-olds can extract not just a smile, but an audible laugh from a 72-year-old who no longer has young grandchildren, you know the book will win youngsters’ hearts. It’s Just a Bunnypalooza by Brenda Faatz and Peter Trimarco will warm little hearts and bring smiles to their faces as they listen to a teacher, parent or grandparent read the bouncy rhyming couplets with alliteration like this: “In Lizzy’s backyard, they all scurried together./She spoke to her friends of fur, fleece and feather.” Or when the little listeners suddenly interrupt the reading because they just have to repeat crazy made-up words like “jigga-wiggalous” again and again. Word inventions are one of the most enjoyed aspects of this series of “It’s just so…” books by this pair of authors who really have their fingers on the pulse of what young children love most in books: stories about animals interacting with children presented through beautifully rendered color illustrations. In It’s Just a Bunnypalooza, Lizzy has her heart set on participating in the upcoming school talent contest and turns to her animal friends for inspiration. But her effort at chirping like a bird, or blowing a bugle produces a blurt that “shook the moose antlers loose!” Her attempts to twirl like a squirrel or flap her arms with the speed of a hummingbird fail. But when she notices how the bunnies dance, she knows she’s found something she can do…until her classmates giggle at her efforts. That does it. Her confidence gone, she’s ready to ditch the whole idea. What can her furry friends do now to restore her self-esteem and get her to bunny-hop, or be-bop? Read and find out what happens! The authors have included a Bunny Dance Glossary at the end of the book. What fun children could have in the classroom if reading this book was followed by some video showing the various dances. I can just see the children now trying to Bunny hop or Boogaloo, tap dance or soft-shoe. Care to demonstrate, Grandma?